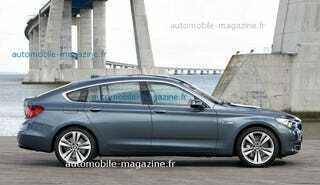 BMW plans for boosting and lifting automotive rear ends continue with the BMW 5-Series GT. While we already saw the concept in Geneva, these are the first official shots of the production version, set to debut at September's Frankfurt Motor Show and go on sale in early 2010. What we've been referring to as the Progressive Activity Sedan was revealed as the BMW 5-Series GT Concept ahead of the 2009 Geneva Motor Show. It blended the rear-end styling characteristics of the 2009 7-series and the CS Concept that made its debut in Shanghai two years ago. The wheelbase is close to the 2009 7-series sedan's 120.9 inches allowing for an extremely roomy interior space with a large capacity rear cargo area. The kidney grille up front shares the proportions of the 7 series along with the shape of the tail lamps. The headlights take more than just a little influence from the now canceled CS Concept. The coupe-like roof line finishes off in a hatchback-style trunk area with a pretty neat closure. The full hatch opens to reveal a large cargo area, but a secondary smaller tailgate opens to reveal a convenient pass through for smaller items. More details and bigger pictures as soon as we have them. Are you in the New York area and want to be in some car videos?